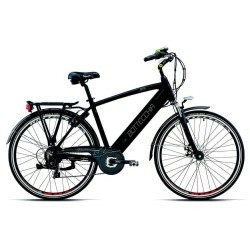 The electric bike Bottecchia BE49 electric Alivio new MTB road Shimano STEPS 36V 250W and Shimano Battery LI-ION 36V 11,6 AH the tube down, is the solution for those who want a power top. Able to travel up to 130 km. with front shock Suntour XCM RL 100mm allows any type of walking, even on dirt roads. weight: . Kg 20,600 Size : 44-48 - 52 cm. - 1 SPEED: How the legislation when it reaches 25 km / h or you stop pedaling, the power is cut off. - 2 SELF: 50 /130 km depending on the characteristics of the path. - 3 WEIGHT: 20.600 kg perfectly balanced.